With the exciting release of the new Jeep Wrangler JL, the ARB engineering and development team have been working hard behind the scenes to design an array of new accessories. With seating for five and traditional rugged performance, the Jeep Wrangler JL Unlimited is a capable vehicle on and off road. It gives owners plenty to smile about, but throws up some challenges when considering storage. In order to make the most of the JL’s cargo area and maximize storage and flexibility of use, a roller drawer module is now available. The RDRF790 incorporates a single drawer and an integrated roller floor top. The design allows for plenty of accessible and secure storage in the drawer. 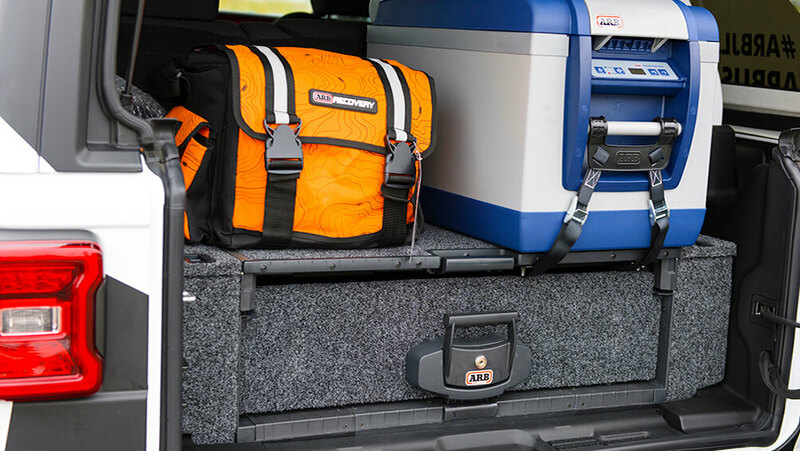 Due to the limited length of the factory cargo area, the 37qt ARB Fridge Freezer is the only size that fits in the popular front/rear orientation. However, the RDRF790 drawer is designed with an integrated roller floor top which slides out as a separate platform. A 50qt ARB Fridge Freezer can be oriented left to right across the roller floor top and rolled rearwards for easy access. Providing a professional and OEM-like finish, the JL4DFKIK side floor and install kit completes the install with precision cut, matching-carpeted pieces which create compartments with removable lids on each side of your drawers.